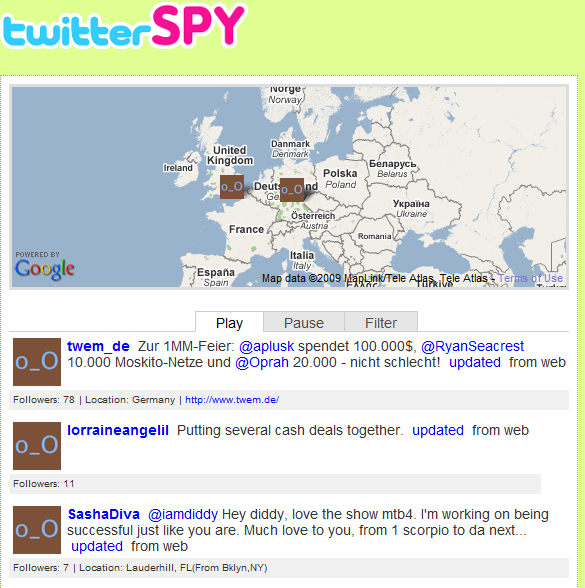 SPECTROX BLOG: I tweet a spy! With more an more people using Twitter as a fun Web 2.0 communication tool, it is becoming a mainstream way of talking. For some people it is becoming an addiction and supercedes e-mail and instant messenger as a way to communicate in groups. Hey, if the President used it and the NASA Mars Rover is using it, it must be great, right? Enter TwitterSpy, a cool mashup application that takes the raw public Twitter feed and allows you to filter it for content or context. Michele Marcucci created this incredibly addicting application as a practical application of her knowledge. Be careful what you tweet, as there are more people than just your close friends watching! Remember, the walls of social networking are very thin, and can be redefined by the service provider at their whim.